$94.8 million: The amount of money spent by dark-money “social welfare” groups like Crossroads GPS in the 2010 election, according to research by the Center for Responsive Politics and the Center for Public Integrity. 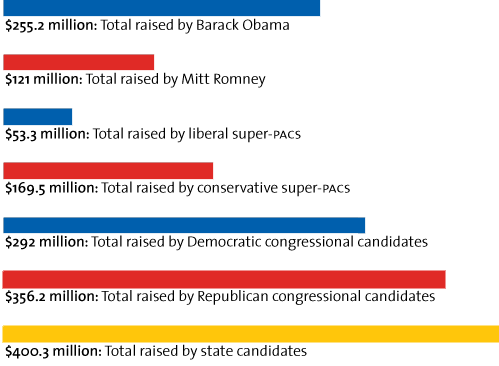 That’s 45 percent more than super-PACs spent during the same cycle. • Follow the Dark Money: The down and dirty history of secret spending, PACs gone wild, and the epic four-decade fight over the only kind of political capital that matters. • 3 Companies, 1 PO Box, and a $1 Million Super-PAC Gift: If Houston computer magnate Robert T. Brockman wants to cover his tracks, he’s not trying hard enough. • How to Sweep Dark Money Out of Politics: Undoing Citizens United, the DIY guide. • Citizens United vs. Sideboob: The court is more worried about a little skin on TV than unlimited corporate money in elections. • Connecticut’s Governor—A Democrat!—Sides With Dark Money: Gov. Dannel Malloy vetoed the disclosure bill over policy and constitutional worries, but reformers say he’s way off mark.